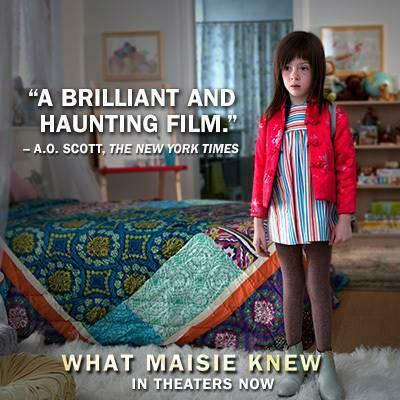 The What: Based on Henry James novella of the same name What Maisie Knew revolves around six-year-old Maisie ( Onata Aprile), who is caught in the middle of a custody battle between her mother , a rock star, and her father. The story is told from Maisie’s point of view. The Who: Alex plays Lincoln, the local bar-tender Maisie’s mother marries in order to score points with the courts, and who forms a deep bond with Maisie. The Why: Because it’s a gorgeous little movie, simple as that really. Lincoln is about as far from Eric Northman as you can get, but yes I would definitely still marry him. Add to the mix a great central performance by Onata, at times your heart will break for her, but there is also plenty of sweetness on display to make you smile. Ovaries have been known to explode at the sight of Onata and Alex bonding together on (and off) screen. It’s a gem of a movie that is worthy of repeat viewing. Anyone else love this movie as much as I do? If you haven’t seen it yet, it is available on DVD and, in some countries, on Netflix.